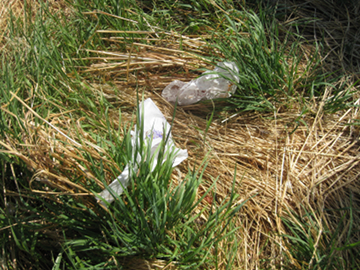 Plastic bags between I-84 and Walmart in Hood River. On first blush, you would expect a lot of pushback from the retail sector over a push by Environment Oregon to pass a law banning use of single-use plastic bags at checkout counters. But Brock Howell, state policy advocate for Environment Oregon, says the idea has generated support not just from the environmental community, but also from the Northwest Grocery Association. Yes, they’re unsightly, blowing all over heck and gone. Yes, they use scarce oil reserves and clog up landfills. But the bigger issue, Howell says, is downstream — literally. SOLV, the Oregon nonprofit devoted to the annual beach cleanups and the mission of “Stop Oregon Litter and Vandalism,” estimates that 12 percent of the garbage swirling around in the ocean, killing fish and birdlife, can be traced to plastic bags. That is nearly double what it was just a few years ago. Environment Oregon hopes to get the next Legislature to approve a statewide ban. If it passes, it would take effect Jan. 1, 2012. California is working on a similar measure. North Carolina has banned plastic bags on its Outer Banks. Greatest success so far has come at the local level. More than 60 communities in the U.S. have banned plastic bags. Around the world, bans or control efforts have generated support in Australia, Bangladesh, China, Ireland, Italy, Mumbai, South Africa, and Taiwan. While it lobbies the Legislature, Environment Oregon is working with working to effect bans in the cities of Hood River, Bend, Oregon City, Lake Oswego, and Eugene-Lane county. Its partner organization, the Surfrider Foundation, is focusing on local bans in Lincoln City and Cannon Beach. The Portland City Council last week committed to a ban, effective Oct. 1, 2011, but only if the Legislature fails to act. And the Kroger Corp.’s Fred Meyer stores in Portland adopted a self-imposed trial ban on plastic bags, beginning Aug. 1. As part of the Oregon proposal, grocers would be able also to charge 5 cents for every paper bag that customers use. The idea is to create further incentive for people to bring their own, reusable bags. A call to the Grocery Association had not been returned at the time of this posting. To learn more, you can attend a roundtable discussion at 6:30 tonight at 6:30 p.m. at Springhouse Cellar Winery, 13 Railroad Ave., Hood River.